I walked through the house lighting candles ..
A kitty cat kept watch at our front door .. mesmerized by the big beautiful snowflakes on the other side of the glass .. the first snow of the season. We poured a couple of glasses of wine .. and checked dinner one last time. Over 100 meatballs .. 2 big pots of spaghetti noodles .. tomato sauce simmering in the crock-pot .. it was everything I'd envisioned .. and more. This very special night was about so much more than dinner .. every person who would walk through the door that evening .. someone near and dear to our hearts. “Here's what we've decided to do to make our lives happier .. we're starting a new tradition we'll call Spaghetti Saturdays. It wasn't long before our little house was filled .. with friends .. neighbors .. colleagues .. and family. Fifteen of the most interesting people you'd ever want to meet. The hours flew by .. one glass of wine turned into two .. plates of spaghetti were filled and refilled .. the sides everyone brought made fantastic compliments .. dessert included such things as rice pudding (!) .. red quinoa cookies .. pecan muffins .. and cream puffs. With each story told .. our worlds got a bit smaller .. or evening a little brighter .. and our hearts that much warmer. It only made sense to head straight to a trusted source when it came to an event as special as this .. and Bon Appetit rarely disappoints. The meatballs a combination of 1/2 italian sausage and 1/2 ground beef. Pine nuts and currants as an addition .. were completely unexpected .. in the best of ways. Gluten-free breadcrumbs made from homemade artisan bread .. without anybody being the wiser. As the weekend draws to a close .. I can't help but be grateful. What a beautiful group of people we're lucky enough to call family and friends. Heat the oil in heavy large pot over medium-low heat. Add the garlic and continue to sauté for another minute or so. Increase the heat to medium-high, add the tomatoes (along with their juice) and 2 Tbsp basil. Bring to a boil. Stir in the remaining 2 Tbsp basil. In a medium-sized bowl, combine the bread crumbs and milk. Let stand 5 minutes. Add parmesan, onion, basil, egg, garlic and pepper. Add sausage, ground beef, pine nuts and currants. Blend well. Using wet hands, form mixture into 2-inch balls and place them on the baking sheet. Made these tonight with my 9-year-old grandson, and we had so much fun. The perfect end to our snowy day here in Montana. Thanks, Ali! Ali, we’ve made these several times, and it’s become our go-to meatball recipe, but I want to thank you for it especially tonight. We’re having Valentine’s Day in, and this was the perfect meal! We were like Lady and the Tramp — spaghetti + meatballs = true romance! I made this yesterday for the second time and it is – hands down – the yummiest meatball recipe ever. It made a lot of meatballs which means lots of leftovers in the freezer (just waiting to turn into meatball subs and two more nights with spaghetti). The little people ate this with gusto and my husband and I relished every bite. Heavenly! I am totally craving Spaghetti now. There is something so satisfying about this meal. Looks absolutely delicious and tempting. Spaghetti Saturdays! I love it! We actually eat spaghetti around here once a week already so I may steal this and start a new tradition lol I love those moments in life that let you know just how small our world really is.. This sounds wonderful! I love the idea of Spaghetti Saturdays and would love to do something similar, although in our case it would be a BBQ as my fiance or myself aren’t very talented when it comes to savoury foods. I’ll just wow with the desserts. This recipe sounds lovely. Holy cow! Clouds are parting. Birds are singing. This is the best spaghetti and meatballs I have EVER made. It’s not just the wine I’m drinking people (I had to open a bottle for this, of course). This is really great! An awesome Sunday dinner for my hubby and three little ones. Your dish looks amazing. I cannot wait to try this recipe. Sounds like such a nice and sweet tradition to cook for the people dear to you. I have never tried Sicilian meatballs, the spaghetti looks so delicious, would love to try these out and your recipe. Your pictures have made me hungry already. Your Spaghetti Saturday sounds so much fun! Glad to know that you started this tradition and what a great way to meet family and friends and make some wonderful memories to treasure for the lifetime! 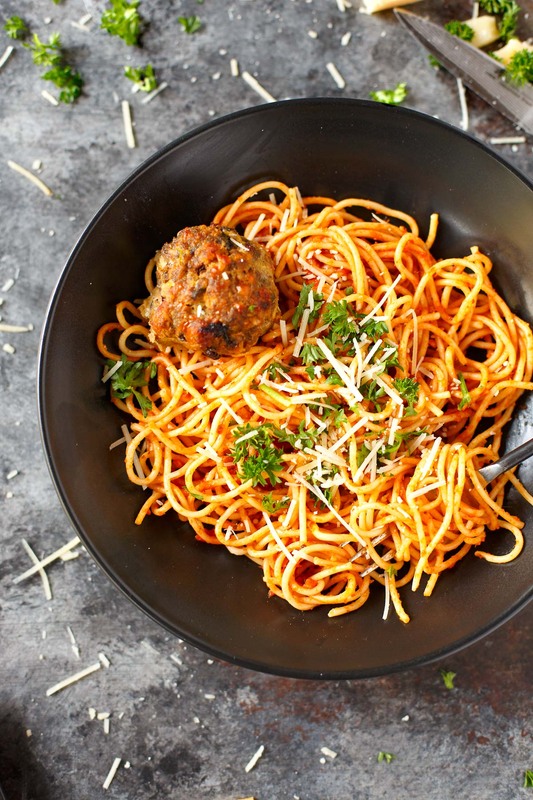 Your spaghetti and Sicilian meatballs look divine and I bet, it would have been a great hit! Pasta is perfect for large gatherings. It’s affordable, simple and can be jazzed up any way you like it. Oh yum! Can’t go wrong with a hearty spaghetti dinner! Those meatballs are HUGE and look delicious! And you guys made 100?! That’s awesome! Sounds like a fun tradition! Your recipes make me wish that we reach a point where I can just reach into my computer and grab the food in front of me. This looks SO GOOD. So nice to read this because it reminded me of how I like small and private things. Now I understand why I always photograph my own environment, and it feels so natural. I’ve just started reading your blog and I loved this close feeling. A spaghetti dinner party sounds awesome! A meal that is simple enough, but still quite delicious. I am sure your guests loved it! That sounds like it was a magical night! It sounds like you have a great array of Friends from over the world! That meatballs and spaghetti is like the perfect mealit’s easy to make and everybody loves spaghetti. I love this idea and may have to do something similar. You know I don’t even know if my kids have listened to Jazz! Makes meal planning easier too but without it becoming boring. I would love to experience one of your dinner parties! They all seem so special and you talk so nicely about all the people invited that I’d love to meet them: the Russian, the Indian, the German… and no wonder they kept filling their plates up, the food looks delicious! My mother grew up next to a Sicilian family in New Jersey and learned how to make really good sauce and meatballs (her signature dish!). However, I have found that if, after you cook the meatballs, you intend to put them in the sauce, it is a huge timesaver to bake the meatballs instead of frying/sauteing them. No favor is lost, and you can add the scrapings from your baking sheet to enhance the sauce. Spaghetti Saturdays is a great idea! A get together with friends is always the best, especially when someone else is cooking. I recently found my perfect spaghetti and meatballs recipe, and it is very similar to yours! One little addition that I think rocks is a little chunk of mozzarella in the center of each meatball. It’s a little ooey-gooey surprise. Delicious! What a beautiful story. I think the best time happen around a table. I had no idea that Sicilian meatballs had that combo. Sounds delicious! Oh yum you can’t beat spaghetti and meatballs. Will definitely try out your meatball recipe as its different from how hubby does ours. Such a simple classic dish and miraculous di[slayed within your photos. 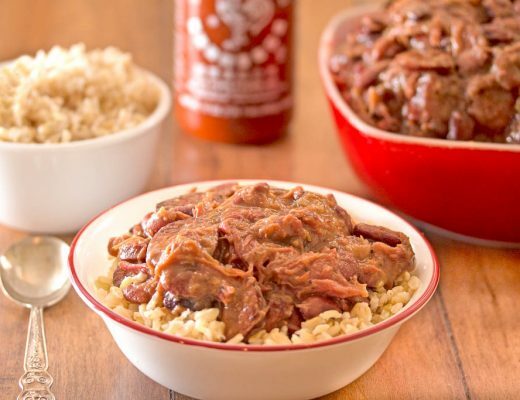 A meal that is sure to please even the pickiest of eaters. Spaghetti Saturday is a great idea. When we move into a bigger house I want to have a monthly Sunday Brunch with all invited. 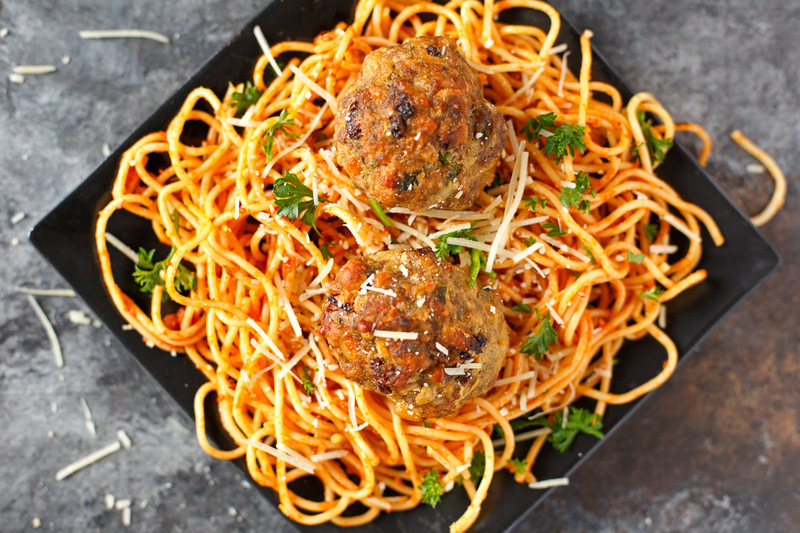 The spaghetti and meatballs look delicious. I’ve always wondered where this recipe came from. I mean, who first thought about combining spaghetti and meatballs? In Italy we eat spaghetti with tomato sauce and also meatballs but never together in the same dish. 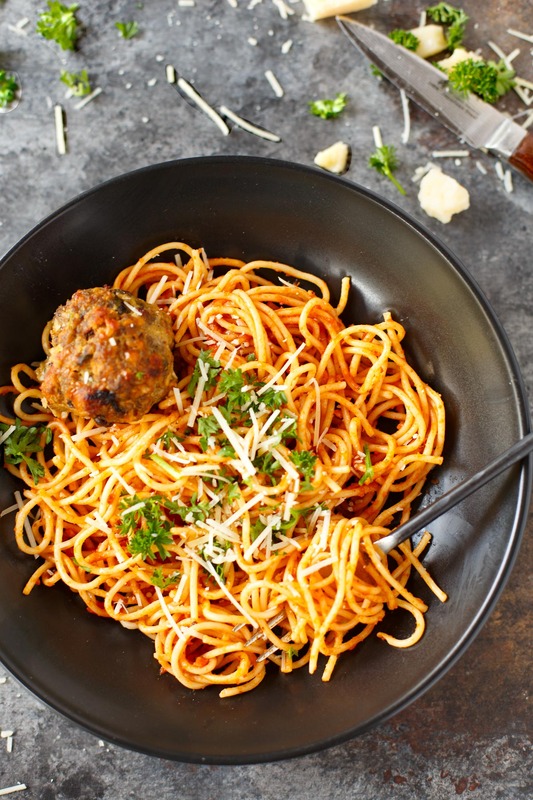 The first and only time I had spaghetti with meatballs was when I traveled in the U.S.
My recipe for meatballs is similar but I use fresh bread torn in pieces and dumped for a while in water or milk and no onion in the mix. In Italy, the marinara sauce pasta is never dressed with Parmesan…. I’d say it’s a wonderful tradition to start especially since it’s all about togetherness. There’s nothing like meeting friends and coming together to catch up and enjoy good food. I’d love to do this as well. I think it’s brilliant! We were planning on having spaghetti tonight but I’ve never made my own meatballs. I’ll have to give it a shot! My husband would go crazy over this recipe and I would love to be invited to a Spaghetti Saturday! I wish I was your neighbor. It sounds like so much fun. I don’t think there is anything better than homemade meatballs. I am actually looking for a gluten-free version (without breadcrumbs). Spaghetti & meatballs is always a hit in our house. I know this is an older post, but I have to say – I make this ALL the time and it’s a family favorite. Thanks, Ali! It sounds like you had one wonderful evening with people dear to you. Those are some of the best nights and memories that will stay with you the rest of your life. Cherish those moments! You got me at jazz music! You sold me on pine nuts and black currants in the meatballs. Never thought of currants, but I can imagine the taste. Gonna try it! My mom taught me the best way to make a tender meatball. No matter what you put in them (meat, herbs, fresh vs prepackaged breadcrumbs, etc), after making your mixture and forming the meatballs, put them in some sort of container and cover them and refrigerate them for an hour or so. Just remember to take them out of the fridge and let them warm up a bit before baking them. I promise, your meatballs will be even better! I’m not really fond of pasta, except for spaghetti. That’s just too good not to eat with pleasure. Everyone thinks I’m a true Italian!! THE MOST DELICIOUS/Easy Spaghetti&Meatballs recipe BAR NONE! This will be on my meal “rotation” from now on!! Thanks!! I love the feel of deep bliss that fills me whenever I have house guests and we’ve just finished dinner. My husband and I sometimes host a pancake breakfast, open invite to neighbors and friends. After all the pancakes have been eaten, there’s this calm happiness that just fills those empty plates back up. This Spaghetti and Meatballs recipe sounds amazing. I wonder if I can adapt it to be gluten free…maybe some experimenting will ensue on this cold Friday morning. I love the tradition you created with cooking for the people dear to you. Your stories in your posts always make me smile. 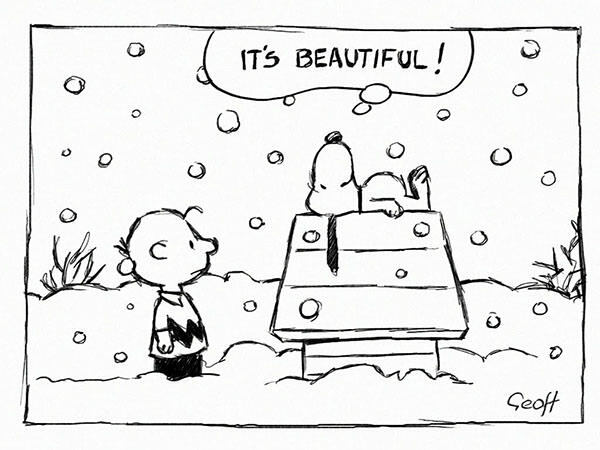 I hope you have many more amazing special Saturdays to come. Oh my goodness, you now have me thinking about Spaghetti Saturdays too! I just told my husband now I am craving Spaghetti and meatballs tomorrow! What a beautiful meal experience. I can’t wait to try this recipe out! Yum! and thanks! My kids love spaghetti and meatballs. I am sure they’re going to love this too! I’ll make some for them. It’s been way too long since I’ve had a good pot of spaghetti. I don’t think I’ve ever had it this way before but I’m all about firsts. Oh my goodness I love this idea of gathering lots of people together for a crazy dinner party! We might just have to do this! Wow, once again fantastic pictures and I love the idea of Spaghetti Saturdays! My go-to recipe for spaghetti and meatballs has been the one in Nigella Bites – it’s in the Rainy Day Cooking section and I’ve been making double batches of the meatballs, freezing them down and then making the sauce fresh as we need it. Half of a standard recipe tends to feed 2 hungry adults, 1 pre-schooler, extra helping for “the man” and some leftovers for lunch the next day – so all in all fantastic. The best bit about these is that the meatballs don’t need par baking or frying, they are just gently popped into the sauce. So excited to try your version! Wow, the meatball certainly look so huge! I love spaghetti as it is easy to make but I never try out with the meatball. I hope to try make the meatball but it will be a smaller version, may be half of the size of the one in the picture. The meatball in the picture is just too huge and I can’t put it in my mouth! If there is a type of food I’m obsessed with at the moment, then it is spaghetti! This recipe will come in handy for me when I’m preparing my lunch next time. I also love meatballs. 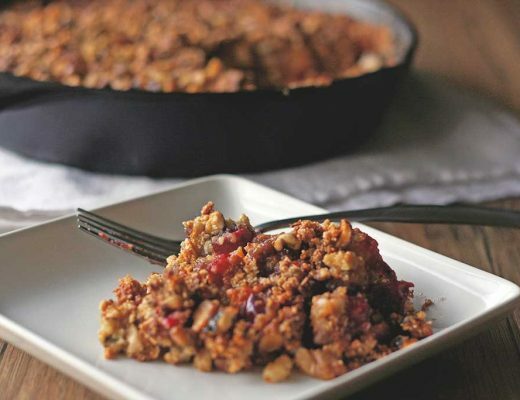 Your pictures make the whole dish look even sweeter and more delicious!I can’t wait to try this out! I’m pinning this infact! Excellent recipe! I’ll be making this with the edamame noodles I just bought. For a vegan version, ground beef can be easily substituted for canned or boiled beans, drained and mashed (still leaving a few whole beans and lumps in the mix). Sounds delish!! never tried sicilian meatballs! Thanks! It ‘reads’ tasty and I will try it next time as meatball variation. Yes, killer, and I’m so glad to see the addition of pine nuts, just like Frankies in Brooklyn. Thanks! Sounds like a perfect way to spend an evening. I love creating special meals for gatherings. Want to know something crazy? I have only made my own meatballs once! Maybe I am lazy! ha! It sounds like you had a great evening, and the spaghetti looks amazing. Those meatballs! I’d love to try it. It’s always nice when you can get together with friends. I love when people invite me over for dinner and they are cooking. I just love spaghetti and meatballs! We have it often. We always did Spaghetti on Wednesdays in our Italian house because Wednesday is Prince Spaghetti Day 🙂 I loved growing up in a big Italian household because we ate GOOD. This turned out AMAZING!! Made me feel so fancy trying a twist on traditional spaghetti! I love me a good bowl of spaghetti and meatballs. So i know this is a recipe i would love. I can’t wait to try. To date, I haven’t really been a fan of spaghetti and meatballs, nor was my husband. However, I made these last weekend by request from a friend who was in need of comfort food (aren’t we all these days?). Other than doubling the sauce and omitting the red pepper flakes, I followed the recipe to the letter, never having made anything like it before. Totally loving the fact that you added pine nuts and currants to those meat balls! Looks absolutely delicious and what a beautiful story to what seemed to be such a successful evening. Wow, now I want to start a tradition like this as well. I also love Bon Appetit as well. I and my husband enjoy watching their recipe and try them out. I haven’t eaten spaghetti in such a long time. I will do this recipe this week. I wonder if our small future apartment will be big enough to start a tradition like this. This spaghetti is perfect for the weekend family gatherings. Your pictures are stunning, made me crave for pasta this rainy afternoon. What a wonderful tradition to start every month. Bringing your friends together and meeting new friends over great music, conversation and laughter. The food is just the topping. That monthly dinner idea sounds fantastic. Those meatballs look pretty darn good too. Nothing makes me happy them opening time with friends, family and loved ones. Sounds like you all had a great gathering. 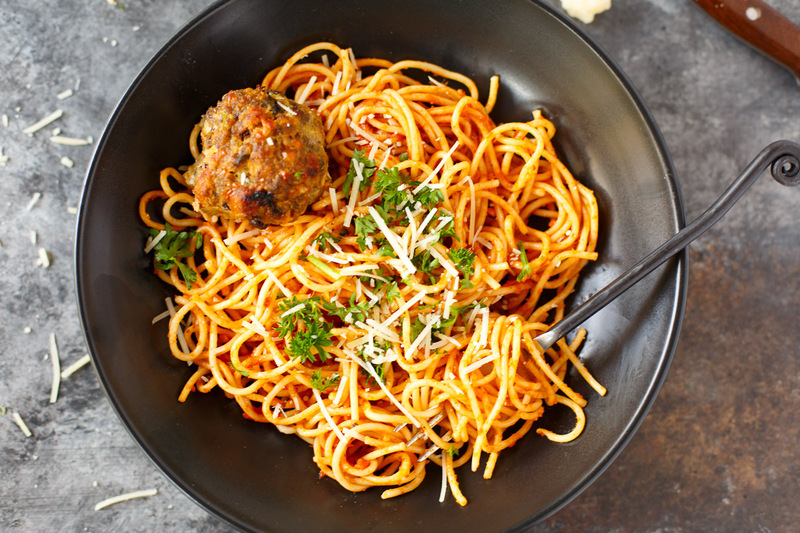 That Spaghetti and Sicilian Meatballs looks amazing! Lovely, I think you’ve inspired me to do something similar, once I clear it with my 5-person household. Thank you for the recipe also. I’ve never thought to put currants in meatballs. Something else to look forward to trying. If you ask me, there is nothing more comforting than spaghetti and meatballs. My boys ask for it for dinner every time they have a rough day at school. It’s like a hug in a bowl. I made this last night for friends who have just welcomed a brand new baby. I packed up about half and delivered it with some good dried pasta, bread, and parmesan. The remaining sauce was too irresistible to put away…pasta-less, I sat down with a bowl of sauce & meatballs, a hunk of crusty bread, and a glass of something bubbly…heaven! Wow, this looks and sounds SO good! 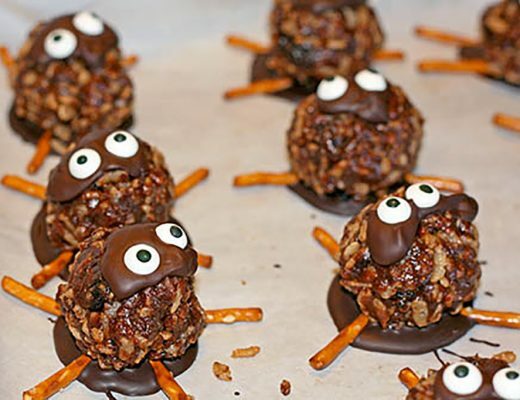 My family and I are vegan, but my wife and daughters are super creative and I think they could veganize the meatballs. There are frozen vegan meatballs that we could buy, but that would be an injustice to this from scratch recipe. We’ve never made our own sauce, so I’m super excited to try that part, whether we do add the meatballs or not. Such a darling post about family and friendship, and what better way to come together than sharing a tasty dish such as this. I never thought about using pine nuts before, it would certainly add a different element to the dish. My grandmother always adds fresh mint (in addition to parsley) to her meatballs. Also, we gave up frying them decades ago. Much easier and less greasy to bake them. I like the final product better too. Bake at 350 about 20 minutes, then turn meatballs and bake another 20 minutes or so. The sauce is all about a l-o-n-g, s-l-o-w simmer. Don’t add your meatballs to the sauce until you put the water on to boil for the pasta, otherwise, they fall apart in the sauce. This is the best meatball recipe I have found yet! My family loves it…I have experimented with this recipe a lot. I cooked the meatballs in regular store-bought sauce, which was good… and I have even tried making the meatballs with ground turkey and cooked them in a cranberry sauce, which was also delicious. 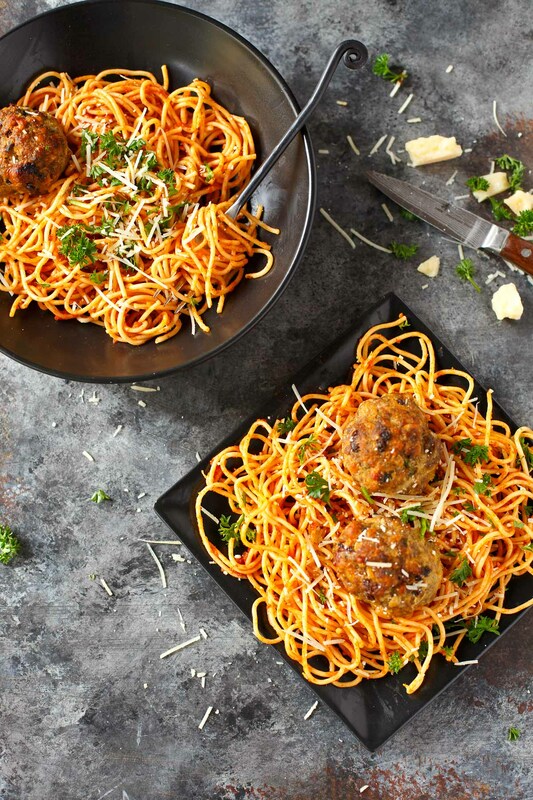 How absolutely delicious does this look, I do have a love for Spaghetti and Meatballs and this seems like it is done so well. do you think I could switch out the beef for turkey? Can you believe that it has been over 4 years since you hosted your very first Spaghetti Saturday and look how far you have come since. I love the idea of creating an event, where the guests can network with long lost friends or even make new pals. In our society its so important to forge connections, as adult life can be so isolating sometimes. Laughter and food is the perfect antidote. My grandmother came from Abbruzzi, and this is what she put in her meatballs and sauce: ground round mixed with eggs, parsley, grated Romano cheese, breadcrumbs grated from a day-old Italian roll, chopped garlic and salt and pepper. She browned the meatballs in lard, then put in a few cloves of garlic and cooked them until they were golden. Then she poured in Italian tomatoes, brought them to a boil then lowered the heat to a simmer. She put in salt, pepper, dried basil, and 1 bay leaf. She cooked the meatballs in the sauce for about 90 min. That was her meatballs and sauce, and it was fantastic. This sounds like such a cool thing to do with your Saturdays. I know having those near and dear to you, eating dinner and just sharing a little bit of yourself with one another . . . it’s heaven really. And having it all come with great comfort food is a good thing as well. The spaghetti and meatballs does look delicious. I really miss the days of dinner parties and hanging out with friends. I was leery of making this without first pre-cooking the meatballs, but this is by far the best spaghetti and meatballs I have ever made. The meatballs ended up a nice brown color, they were not overcooked and I think putting them in before browning allowed some of the meat flavor to seep into the sauce. I great recipe! Looks so yummy its making me want to go back to Italy. Molto Bene!